We will gather for wine and hors d’oeuvres at 6:15, followed by a wonderful faculty concert, dessert, and mission-based auction. Please plan to attend and bring your friends! There will be a cash bar. Purchasing tickets ahead of time will allow us to prepare enough food for everyone! If you would like to purchase your ticket at the door but know you will be attending, please email us at info@portlandconservatoryofmusic.org to let us know. 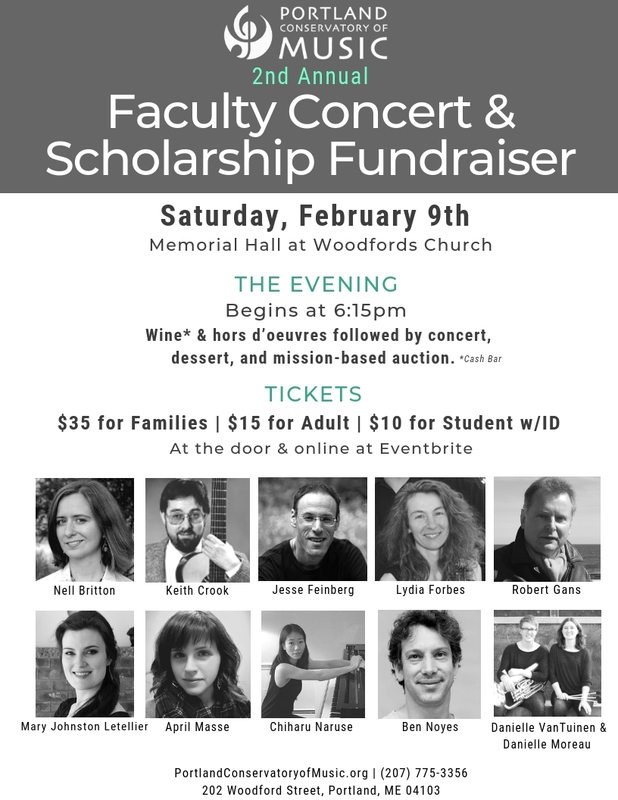 Financial support of this Faculty Concert will directly fund scholarships for students who are challenged by the tuition cost of music lessons. If you would like to mail in an additional sponsorship donation to the PCM office, please note that it is for the Faculty Concert on February 9th. Thank you for participating in and supporting our important music education mission at the Portland Conservatory of Music.